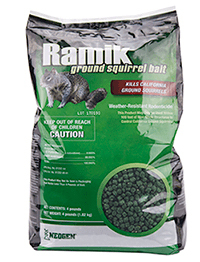 Ramik Ground Squirrel Bait is a new, unrestricted rodenticide specifically labeled to control California ground squirrels (Otospermophilus beecheyi). The nuggets feature the active ingredient diphacinone, and do not require a license or permit for purchase or use. Packaged in 4-lb., resealable bags, the nuggets are hot extruded so they are weather-resistant without the wax.